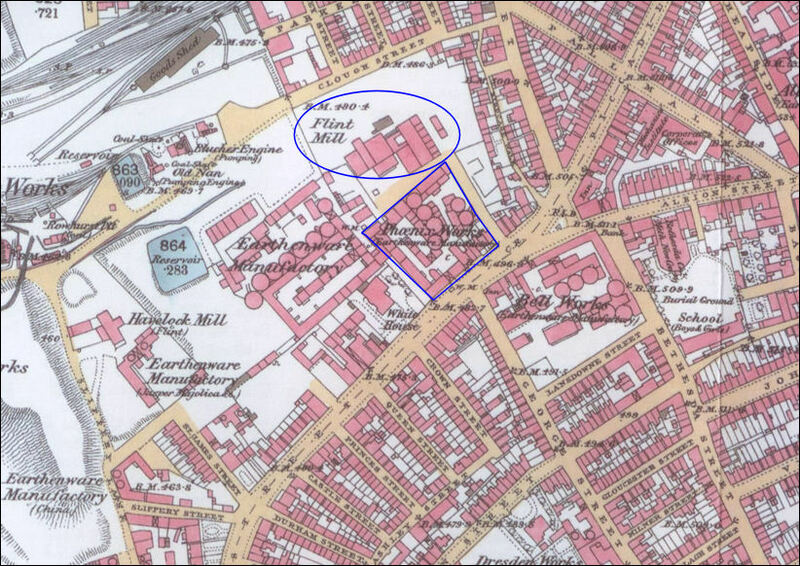 Originally Broad Street was called High Street, Shelton. 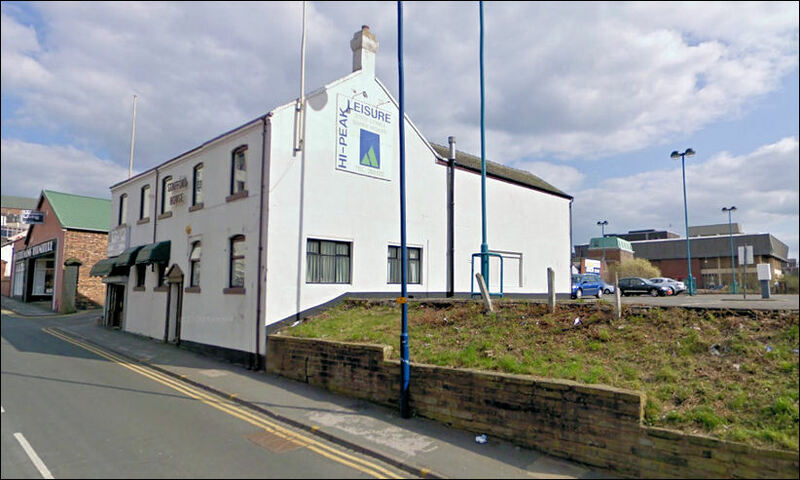 For a brief period in 1836 the business was Read, Clementson & Anderson. 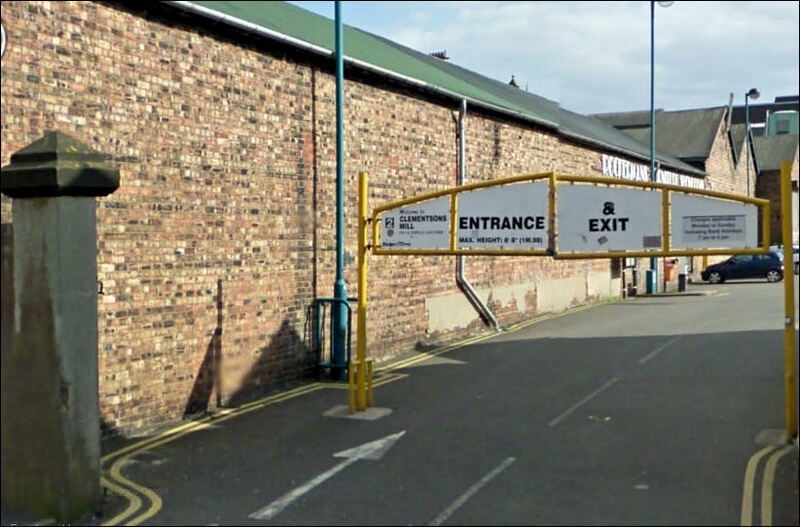 In 1839 Joseph Clementson became the sole proprietor of the Phoenix Works which he enlarged in 1845. 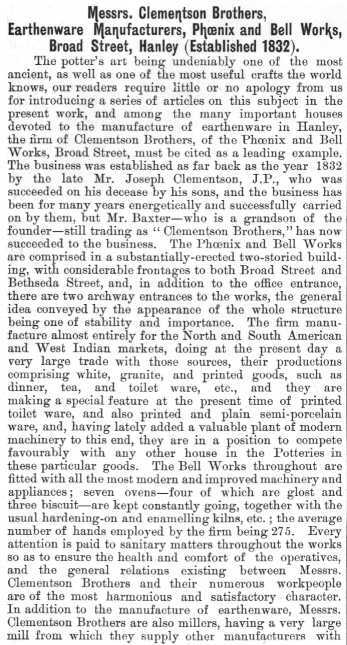 In 1856 Clementson also purchased the Bell Works on the other side of the road as the Phoenix Works. 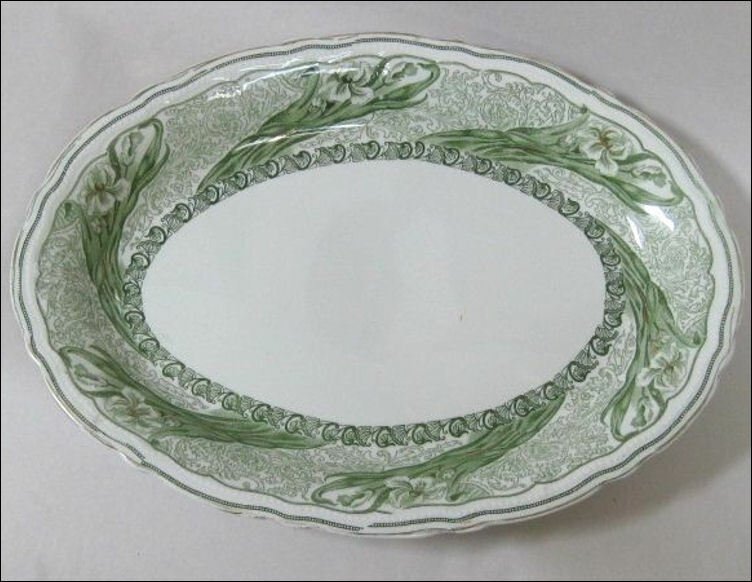 Joseph Ford, in partnership with Joseph Clementson, operated a flint grinding business - this partnership was dissolved in 1858. 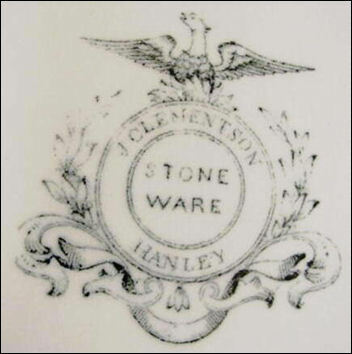 Joseph Clementson retired in 1867 and his four sons (Francis, Joseph Walton, Matthew and John) continued the business as Clementson Brothers. 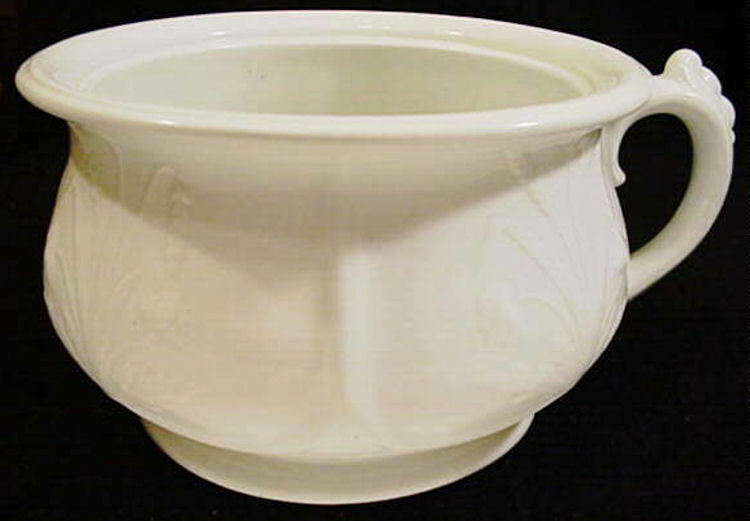 The brothers operated a business as Francis Clementson and Company, at Saint John, in the Province of New Brunswick, in the Dominion of Canada, as Earthenware, China, and Glass Dealer and Cigar and General Merchants. 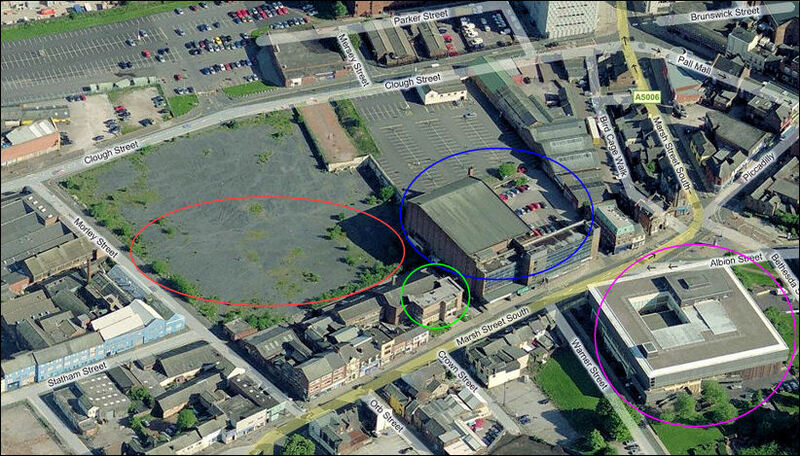 By 1893 Clementsons were recorded as having 275 employees. 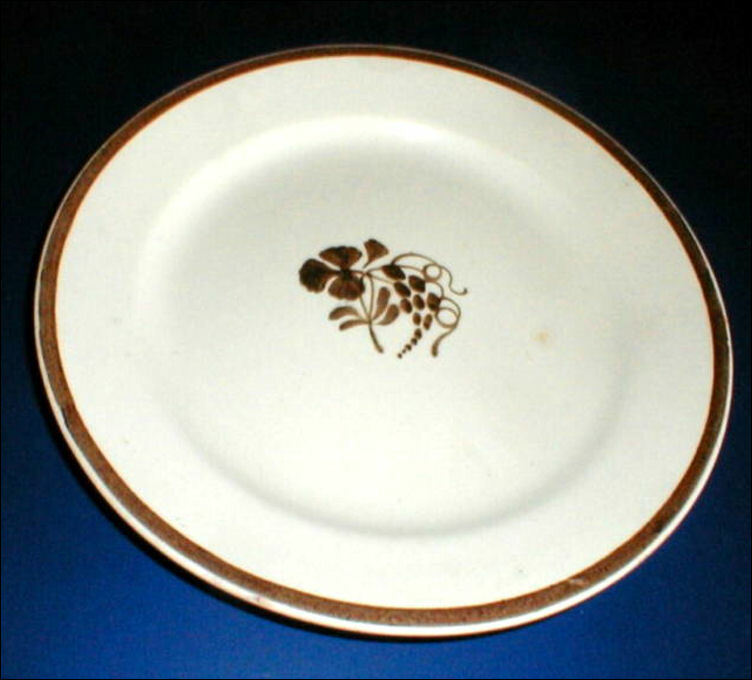 As well as manufacturing earthenware they also operated as millers for themselves and others. 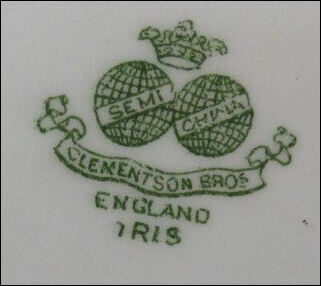 The business continued as Clementson Brothers until 1916. 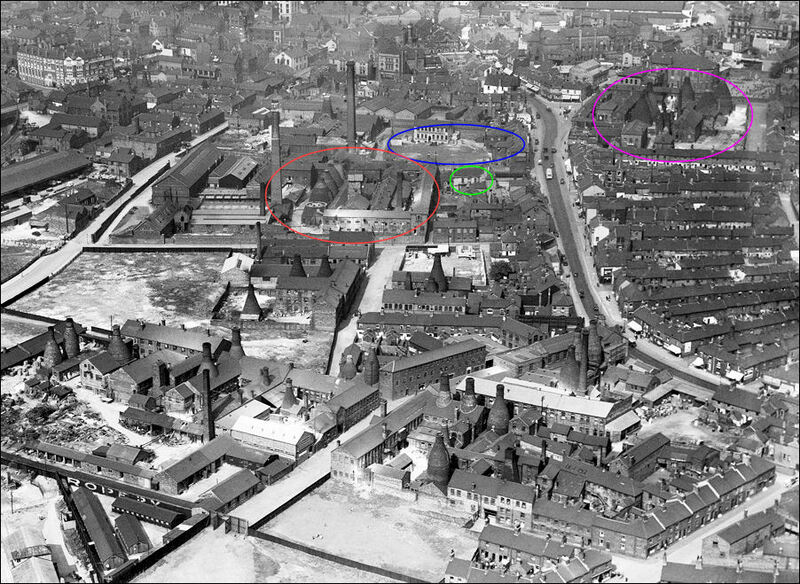 At some time between 1916 and 1933 (see photo below) the bottle kilns and pottery works were demolished - just leaving the mills. 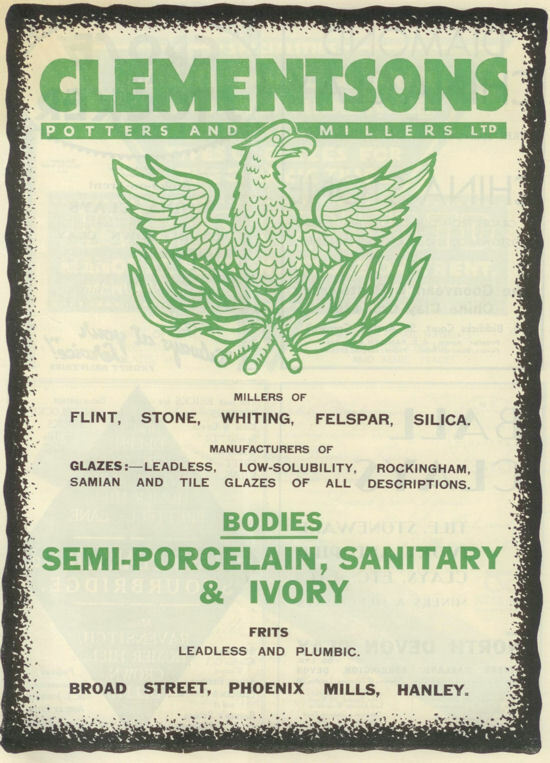 The business continued as Clementsons Potters and Millers Ltd as the Phienix Mills (see 1937 advert below). 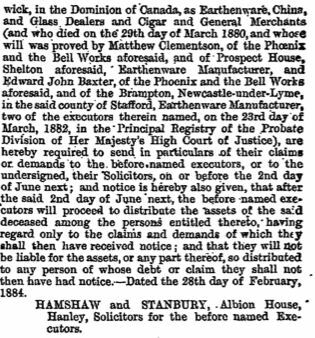 NOTICE is hereby given, that the Partnership between Joseph Ford and Joseph Clememson, of Shelton, in the parish and borough of Stoke-upon-Trent, in the county of Stafford, Flint Grinders, carrying on business there under the firm of Joseph Ford and Company, was dissolved on the 24th day of June last, —Witness the hands of the said parties the 1st day of November, 1858. 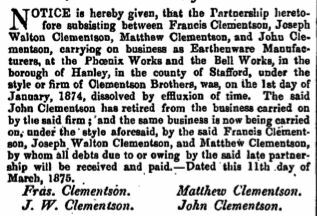 NOTICE is hereby given, that the Partnership heretofore subsisting between Francis Clementson, Joseph Walton Clementson, Matthew Clementson, and John Clementson, carrying on business as Earthenware Manufacturers, at the Phoenix Works and the Bell Works, in the borough of Hanley, in the county of Stafford under the style or firm of Clementson Brothers, was, on the 1st day of January, 1874, dissolved by effluxion of time. 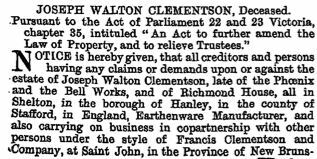 The said John Clementson haasretired from the business carried on by the said firm ; and the same business it now being carried on under the style aforesaid, by the said Francie Clementson, Joseph Walton Clementson, and Matthew Clementson, by whom all debts due to or owing by the said late partnership will be received and paid— Dated this 11th day of March, 1875. Pursuant to the Act of Parliament 22 and 23 Victoria, chapter 35, intituled "An Act to further amend the Law of Property, and to relieve Trustees." 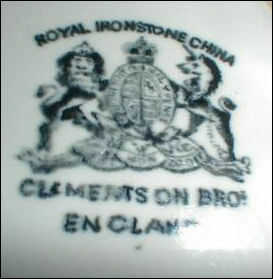 NOTICE is hereby given, that all creditors and persons having any claim or demands upon or against the estate of Joseph Walton Clementson, late of the Phoenix and the Bell Works, and of Richmond House, all in Shelton, in the borough of Hanley, in the county of Stafford, in England, Earthenware Manufacturer, and also carrying on business in copartnership with other persons under the style of Francis Clementson and Company, at Saint John, in the Province of New Brunswick, in the Dominion of Canada, as Earthenware, China, and Glass Dealer and Cigar and General Merchants (and who died on the 29th day of March 1880, and whose will was proved by Matthew Clementson, of the Phoenix and the Bell Works aforesaid, and of Prospect House, Shelton aforesaid, Earthenware Manufacturer, and Edward John Baxter, of the Phoenix and the Bell Works aforesaid, and of the Brampton, Newcastle-under-Lyme, in the said county of Stafford, Earthenware Manufacturer, two of the executors therein named, on the 23rd day of March, 1882, in the Principal Registry of the Probate Division of Her Majesty's High Court of Justice), are hereby required to send in particulars of their claims of demands to the before named executors, or to the undersigned, their Solicitors, on or before the 2nd day of June next; and notice is hereby also given, that after the said 2nd day of June next, the before named executors will proceed to distribute the assets of the said deceased among the persons entitled thereto, having regard only to the claims and demands of which they shall then have received notice; and that they will not be liable for the assets, or any part thereof, so distributed to any person of whose debt or claim they shall not then have had notice.—Dated the 28th day of February, 1884. 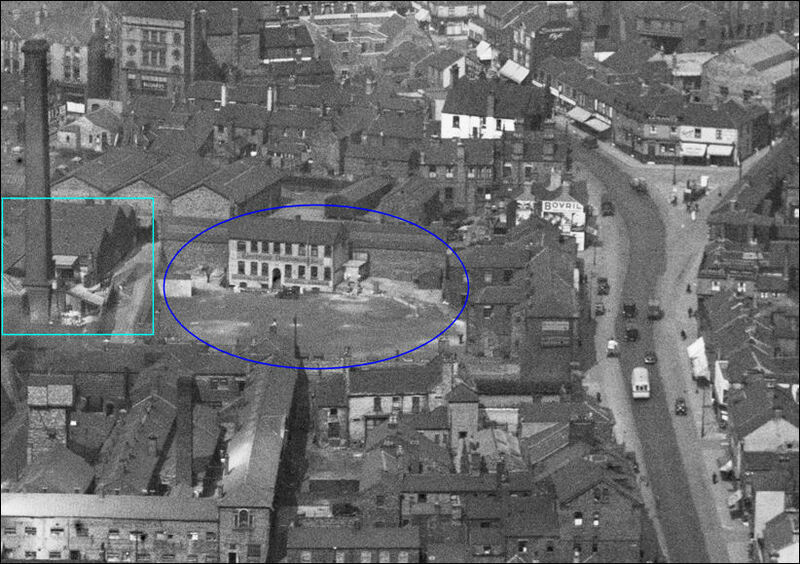 HAMSHAW and STANBUBY, Albion House, Hanley, Solicitors for the before named Executors.